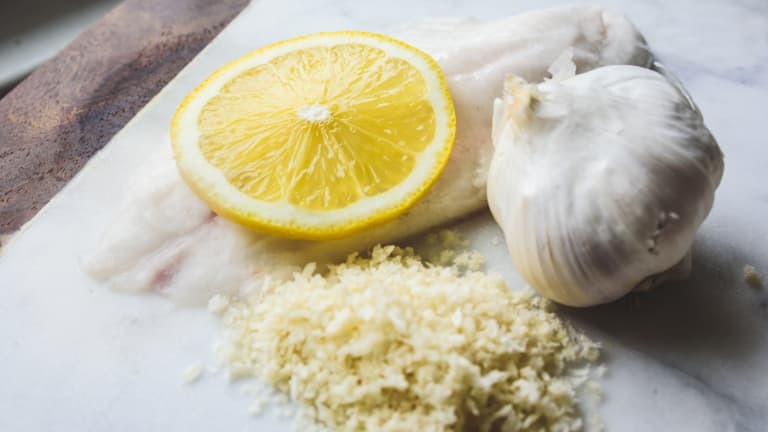 Frozen fish is a great freezer staple—not only is it much cheaper than fresh fish, it defrosts quickly enough to make at the last minute on a weeknight. This recipe serves two, but scales easily: Just add another fillet for each extra person you&apos;re serving and increase the egg and breadcrumb mixtures accordingly. Gluten-free: Use almond meal instead of breadcrumbs. Paleo: Use almond meal instead of breadcrumbs; omit parmesan cheese. 1. If necessary, thaw packaged frozen fish in a bowl of cold water (may take 20-30 minutes, depending on the size of the fillets). Preheat oven to 425. Drizzle a bit of olive oil a baking dish large enough to fit your two fillets or line with parchment paper. 2. Blot excess moisture from fish with a paper towel. In a small bowl, beat egg with lemon juice and garlic. 3. In a shallow bowl or on a large plate, combine breadcrumbs, parmesan, thyme, nutmeg, salt and pepper. 4. Using your hands, dip a fillet in the egg mixture, then into the breadcrumb mixture. Lay in baking dish. 5. Bake for 10-15 minutes, or until opaque and easily flaked with a fork. *Note: If you don't have fresh garlic, add 1 tsp garlic powder to the breadcrumb mixture instead.